Freshwater Middle Jurassic assemblages occur within the deltaic and lagoonal sequences as transported accumulates in marine and brackish water sediments. invertebrates which produce complex burrow systems are marine, these freshwater deposits were seldom very bioturbated. 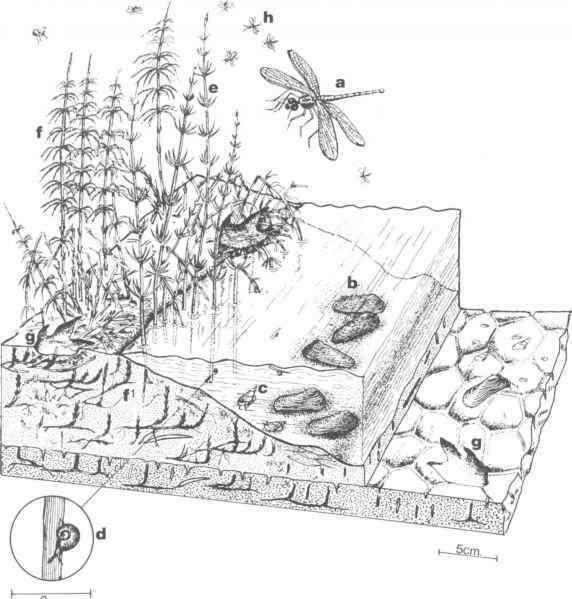 Plants were represented by terrestrial and marsh-dwelling forms. They occur either as drifted fragments, as standing stems with their roots preserved or just as roots; the commonest standing plants were horsetails (Equisetales). Rippled surfaces of some sand beds show footprints of swamp-dwelling dinosaurs and polygonal desiccation cracks, an assemblage providing evidence of intermittent exposure. Modern Viviparus is able to feed on both deposited and suspended material; it is one of the few gastropods that can employ a process of ciliary feeding to supplement the normal means of obtaining food. Its Middle Jurassic ancestor, Bathonclla, is believed to have lived in similar freshwater habitats and may have had the same ability to vary its feeding mechanism according to what was available. Modern Unio is a filter-feeding bivalve with an incompletely fused mantle; it lives exposed on lake and stream channel floors, or at best it can burrow a small distance into the sediment. Like many freshwater bivalves, the umbonal areas on Unio are often eroded; the earlier formed parts of the shell, being exposed to freshwater deficient in carbonate during the life of the individual, are often dissolved. Some freshwater beds may be rich in charophytes; these small (0.1mm) spheres are the female reproductive bodies (oogonia) of freshwater calcareous green algae. Other beds may contain freshwater ostracodes, which can sometimes be distinguished from marine ostracodes by their smooth shells. Freshwater sediments occur in the Middle Jurassic in Britain on the Yorkshire coast, in Scotland and in the English Midlands. Between the 'delta' complexes of north-east England and the open sea to the south, lay an area with restricted euryhaline faunas and predominantly clay deposition. These inhabited lagoons were separated from the open sea by barriers that consisted of oolite shoals, mud flats and archipelagos, but their isolation was not complete. In general, the lagoonal clays with fewer genera of euryhaline animals are thought to have been more isolated than those with more genera. There is a complete gradation between the most restricted of these euryhaline communities and the normal diverse, open sea, communities (Figs. 79, 80 and 81). By contrast, there are only a few examples of gradations (for instance in West Scotland) between the euryhaline communities and wholly freshwater communities (Fig. 73). When viviparids, Unio, freshwater ostracodes or charophytes are present in these lagoonal sediments, they often occur as lenses of drifted shells, probably introduced by floods. clumps composed solely of oysters may have grown as discrete clusters. This second association is indicated by the presence of encrusting serpulids, bryozoans and other fully marine epifauna on the oyster shells. Modern oysters require stable substrates and are often particularly abundant when burrowers are absent. Faunas dominated by oysters normally occur in very shallow water and the surrounding sediments are often fine grained. The fine material was trapped by the animals themselves; the sediment is therefore often much finer than other sediments characteristic of very shallow environments. Rhynchonellids and ostracodes often occurred with the oysters and as the salinity approached normal, marine Modiolus, Astarte, and a variety of other bivalves occurred. Corals, terebratulids, gastropods and a few echinoids (for instance Clypeus) lived in some of the less restricted lagoonal environments, especially within the barrier areas of the English Midlands. Two fossil groups which are seldom found (except as rare, isolated, drifted individuals) are the strictly stenohaline ammonites and belemnites. Lagoonal coral faunas were usually limited to three genera (Isastrea, Thamnasteria and Microsolena) which occurred in small patches on the lagoon floor and were often bored and encrusted by bivalves and serpulids. Modern corals and echinoderms are sensitive to reduction in salinity below 27° /00 (parts per thousand), but some corals can tolerate raised salinities (up to 40° /00), and it may well be that some lagoons had restricted faunas because the salinity was above (rather than below) that of the open sea (about 35°/00). Salinity is not the only factor causing the restriction of faunas in modern lagoonal environments. The variability of the environment is perhaps the main one; very shallow, partially isolated water is drastically affected by variations of temperature and by turbulence resulting from seasonal changes and from periodic storms. Corals are particularly sensitive to these changes, and are thus likely to be absent in areas subject to storms and floods. 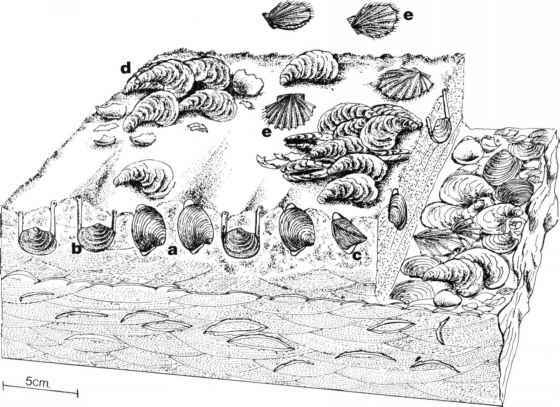 In these restricted communities, the bivalves comprised the bulk of the infaunal and epifaunal suspension feeders. The echin-oids were probably predators and scavengers, while corals were carnivorous, the individual polyps within a colony feeding on zooplankton in the water. Restricted clays occur in the Great Estuarine Group of western Scotland, and the Great Oolite Group of Yorkshire and central England. Marine ironstones in the Middle Jurassic were similar in many respects to those in the Lower Jurassic (Fig. 69), and the same difficulties arise in the interpretation of their formation. When little quartz sand was present, the fauna was dominated by in-faunal and epifaunal suspension-feeding bivalves. Suspension-feeding brachiopods are occasionally present and certain beds contain nerineid gastropods, some of which were probably grazers. Many of the ironstones are not very fossiliferous, but when fossils do occur they are often in lenses as drifted shells. In these cases the shells are seldom worn and are probably of local origin. growth of the ooids suggests that algae may have been responsible for trapping the iron-rich material. If this interpretation is correct, the algae would have been a source of food for the herbivorous nerineids. 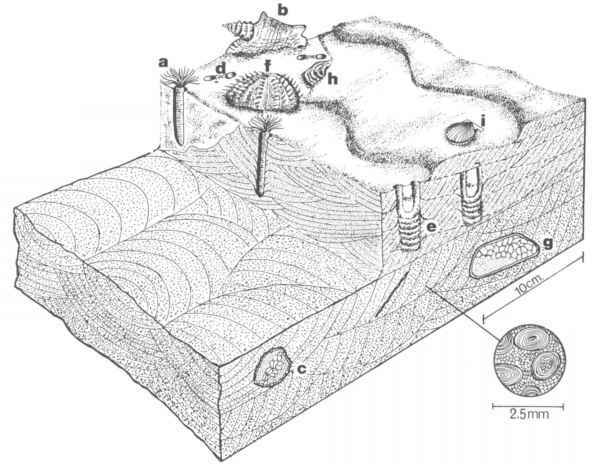 The abundance of suspension feeders in the ironstone shell beds indicates relatively shallow water, with sufficient turbulence to carry suspended organic matter. The sporadic occurrence of terebratulid and rhynchonellid brachiopods indicates that the water was clear and that the sea floor was stable enough for pedicle attachment. 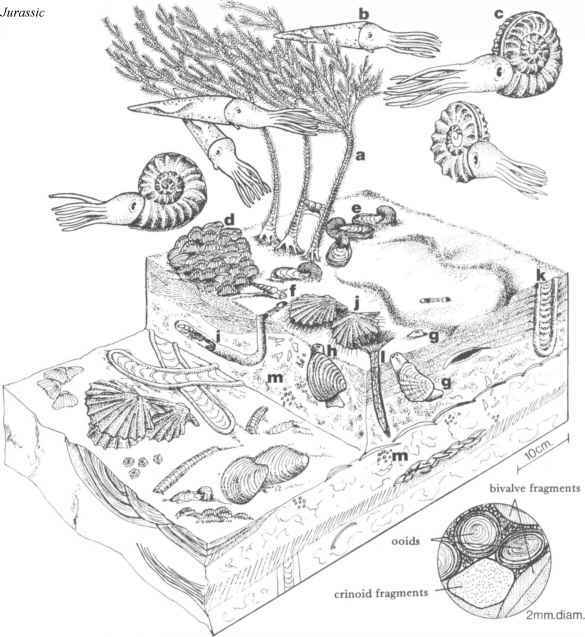 Faunal diversities in the ironstones were sometimes high, with free-living epifaunal bivalves (Varamusium), thicker-shelled pectinids, byssally attached streamlined bivalves (like Gervillella) and infaunal suspension feeders (like Astarte and Trigonia). Scavengers and carnivores were represented by echinoids (Acrosalenia), and rarely by ammonites and belemnites. The ironstones sometimes contain large amounts of quartz sand in addition to the iron-rich ooids and shell debris, and in the more sandy beds faunas were sparser. Like many pure quartz sands deposition rates may have been too high and the substrates too unstable for many epifaunal and infaunal animals to have become established. Fully marine sands with diverse faunas were rare in the Middle Jurassic of Britain. More common, especially in the English Midlands, were sands that contained restricted faunas. Gradations also existed between sand and mud, sand and calcarenite, and sand and ironstone. Diverse faunas occurred in sands in the west of Scotland where oysters, thick-shelled pectinids, and a variety of other bivalves are associated with some brachiopods. When conditions were fully marine, rich faunas of ammonites became established. As in the Lower Jurassic (Figs. 66, 67), a small amount of mud in the sands provided a more stable habitat for burrowers, which included bivalves (pholadomyoids and veneroids), crustaceans (Thalas-sinoides, Rhizo cor allium, Diplocraterion), and worms (Chondrites). Sands in the English Midlands contain restricted faunas. Oysters are the most widely distributed fossils; they occurred in deposits where the salinity was low. 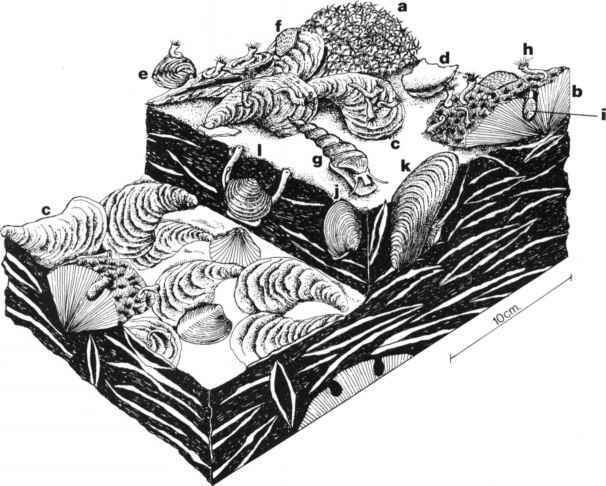 With increasing clay content infaunal bivalves (Astarte, Lucina) flourished. The community depicted is from a Midlands sand with a clay component. Sandy environments were present in western Scotland and in the English Midlands during the Middle Jurassic; ironstones are present in Yorkshire, Lincolnshire and Northamptonshire. Oolitic sediments contain ellipsoidal or spherical grains up to 1mm in diameter which consist of a series of concentric carbonate laminations surrounding a nucleus. In modern carbonate areas like the Bahamas, these ooids are formed in the shallow turbulent areas between the open sea and the calm hypersaline lagoons. Modern ooids are composed of aragonite but ancient ooids are normally recrystallized into calcite. Unbroken and indigenous fossils in the Middle Jurassic oolites are rare, generally consisting of thick-shelled oysters, pectinids and echinoderms. Most of the material is fragmented and many of the grains have been overgrown by carbonate laminae. The limestones are often cross-bedded in layers ranging up to 2m in thickness and the original sediments appear to have formed dunes with mobile surfaces. This surface instability probably accounts for the scarcity of the fauna and the rarity of unbroken shells. The scavenging shallow-burrowing echinoid Pygaster and the grazing gastropod Purpuroidea could survive these conditions and some pectinids were also tolerant of the unstable substrates and turbulent water. This assemblage compares closely with that from a modern oolite sand from the Bahamas. During phases of dune stabilization the sediment was sometimes penetrated by the vertical burrows of suspension feeders. Some of these burrows contain clays that accumulated during slack water episodes. In the Midlands, interbeds of clays within the oolites sometimes contained material derived from nearby rivers such as drifted logs, reptilian bones and teeth, and freshwater ostracodes (McKerrow et al. 1969). In sublittoral bays and lagoonal areas where the water was too turbulent to allow the development of continuous algal crusts (stromatolites), blue-green algae grew around shell fragments and trapped carbonate sediment to form algal 'snowballs' that are termed oncolites or pisolites. As these 'snowballs' grew their well illuminated upper surfaces tended to grow faster and because current action periodically rolled them around their internal laminations are discontinuous. These structures are much larger than ooids and often exceed 15mm in diameter. Oncolitic limestones seem to have formed in fairly turbulent waters and they contain few complete shells. However, they sometimes contain the fossils of epifaunal suspension feeders such as encrusting and cementing bryozoans and corals. Some of the echinoids also were able to live under these conditions, particularly the rapid burrowing forms (irregulars) or thicker-shelled surface-dwelling cidarids (regulars). Grazing gastropods were present too, feeding upon the algae. These environments developed mostly in the Midlands and south of England, but they spread periodically into Lincolnshire and Yorkshire.